Chauffeur driven classic VW Campervan for wedding hire. 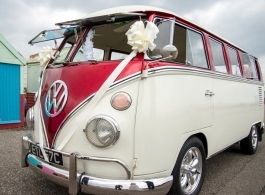 'Candy' is a 1965, 13 window Deluxe VW Split Screen camper van is a beautiful choice of transport for your wedding day. With its Old English White and Candy Red colours she gets attention where ever she goes and is a photographers dream especially when decorated with your choice of coloured ribbons and bows. Perfect for the Bride & her Father then Bride & Groom but also excellent for Bridesmaids.